Speed and tread depth are the chief killers of wet road grip. I was about 20, and a full-time student. And like other students, the car that I was driving was nothing flash - although it was unusual. A tiny 1973 Honda Z, it used a microscopic two-cylinder engine - just 360cc. The tyre size was as you'd expect - I think 145s were considered wide - and the mass bearing down on them was amongst the lowest of any car on the road. On my commute to college there was a long straight stretch of dual-lane road, polished smooth by heavy traffic. This day it was raining, the water streaming across the slick bitumen surface. The speed limit was 100 km/h, and - like all young people - I never went any slower. The road passed an airport, and here there was always a gusting crosswind, the open space allowing the wind to blow unimpeded. At 100 km/h the tacho showed 6000 rpm - that was the car's gearing in top - and with the sound system cranked, I hadn't a care in the world. But that changed in a millisecond. First the steering went eerily light - it was a beautifully direct and precise system, and this sudden lack of road feel was disconcerting. Then, ever so slowly, the car started to develop a yaw angle to the road: it was still travelling forward at 27 metres a second, but was no longer parallel with the lane. I was stuck inside a fragile, lightweight car - 'crashworthiness' was a term never heard by its designers - over which I had little control. I thought I was about to die - and if the car had left the road, I probably would have. I eased off the throttle, and to my everlasting relief, the front tyres gripped through the water, and I was able to gradually get the car straight The yaw angle had been so small that other drivers probably hadn't even noticed it, but I knew that for a few moments I had been skating along, out of control. Recent research has shown that both longitudinal grip (braking and accelerating) and lateral (cornering) grip is reduced in wet road conditions to an extent never before realised. And not only does grip decrease when the road is wet, but it massively decreases when the tyres are worn - even when they are still legal in tread depth. In fact, as a rule of thumb, in some conditions tyre grip goes down at the same rate as the percentage the tyres are worn. That is, tyres with only 50 per cent of the new tread depth have only half the wet road grip. 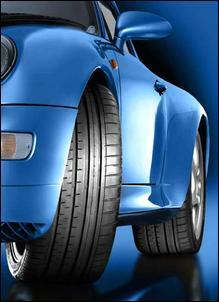 Seventy-five percent worn tyres have lost three-quarters of their grip.... It's a statistic which is far worse than previously thought, so it's worthwhile taking a good look at the Society of Automotive Engineers research paper that shows these results. Read a tyre textbook and almost certainly you'll see the classic photo of a mid-1960s research Jaguar, front tyre completely stopped as the car drives at speed across standing water. The tyre is aquaplaning - spaced above the road with a cushion of water between it and the bitumen. The wheel stopped turning because in this condition it has almost zero grip on the road. As you would expect, directional stability is completely lost, and the car can be neither braked nor accelerated. 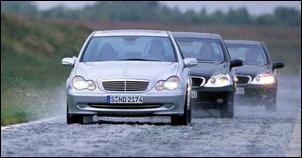 However, true aquaplaning is rare. Much more common is the reduction in grip associated with the lubricating affects of water: the tyre doesn't need to be spaced from the road surface before it starts to lose lots of its grip on the road. 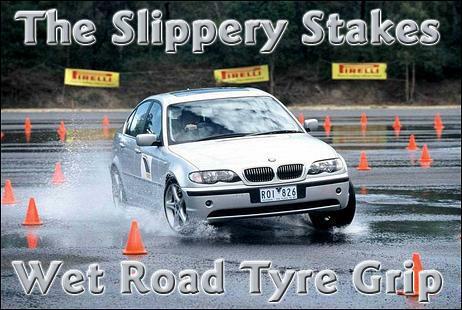 The relationship between wet road grip and a tyre is complex. Factors that will affect the grip levels include the mass bearing down on the tyre, the tyre construction (type, brand, tread patterns, compounds), the road surface, tread depth and the amount of water on the road. In addition, speed is a very important factor. In fact, one study concluded that tyre-to-road friction levels at low speeds are determined primarily by the road surface condition, and at high speeds primarily by the tyre tread condition. In addition, when considering on-road car safety and control, it is a vital consideration which end of the car has the most worn tyres fitted. This is because the majority of drivers have greater difficulty in controlling a slide that has resulted from oversteer (the rear of the car sliding) than understeer (the front of the car sliding). 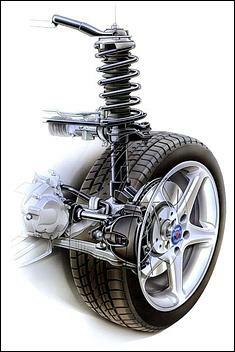 In addition, in many cars the rear tyres of the car have less mass bearing down on them - and the tyres with the best grip should be placed where there is the least weight. It's for these reasons that a pair of new replacement tyres should in nearly all cases be fitted to the rear of a car - not something many tyre retailers will tell you. 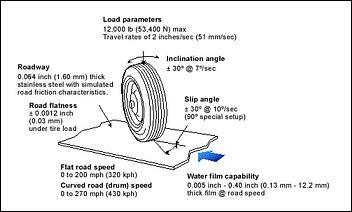 Reported in a recent SAE paper, William Blythe (Consulting Engineer) and Terry Day (Engineering Dynamics Corp) undertook an extensive series of tests to quantify the changing level of grip of a tyre having varying tread depths and working on a road with differing amounts of water on it. The tests were primarily carried out on a flat bed tyre test machine, which consists of a belt of 80-grit polycut material (manufactured by the 3M company) backed by a stainless steel plate. The load parameter on the tyre can be held constant at various pre-determined levels, while camber angle and slip angle (the latter the difference between where the angle is pointing and where it actually goes) can also both be varied. In addition, different depths of water on the 'road' can be specified. 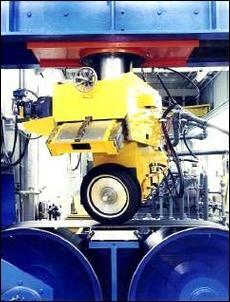 Tyres with varying tread depths were tested, with the tyres being shaved to attain the specified tread depth. The first series of tests undertaken were for braking friction levels - these results will be either identical (or at least indicative) of acceleration performance as well. As vehicle speed rose, the grip provided by the tyres decreased - it really does make sense to drive more slowly in wet conditions. With a water depth of just 1.3mm a new 215/75-15 (no we don't know why such a high profile tyre was picked, either!) Michelin Symmetry tyre dropped in frictional coefficient from just under 1.2 down to 0.6 as speed rose from ~30 km/h to ~130 km/h. So, a brand new tyre with a tread depth of 7.9mm had around half of the braking and acceleration grip at high speed on a wet road than it had at slow speeds! And if a brand new tyre was that bad, what about a worn tyre? With the tread of the same tyre reduced in depth to 1.6mm, by 100 km/h the longitudinal peak frictional coefficient had dropped to 0.1 - basically, the tyre had no grip at all. Even the gentlest braking would result in wheel lock-up. And you didn't think that a tyre with 1.6mm of tread depth was dangerous? If that drop in performance occurred in a water depth of only 1.3mm, what about in deeper puddles? The interesting news is that at 100 km/h things didn't get much worse - whatever the water depth, if the tyres were badly worn then a frictional coefficient of around 0.1 was experienced at this speed. However, as the water got deeper (for example, 3.8mm depth), the tyres lost their grip at progressively lower speeds. For example, in 1.3mm of water, a tyre with 3.2mm of tread depth (that's not a worn tyre is it?!) had a frictional coefficient of 0.6 at 80 km/h, while in 3.8mm of water that had halved to 0.3. In fact, "Peak friction values indicates tyres of all tread depths, except the new tyres, are close to or at hydroplaning (friction values of 0.1 or les) at 60 mph [~100 km/h]. A well-treaded tyre in 0.15 inches [3.8mm] of water behaves similarly to a worn tyre in 0.05 inches [1.3mm] of water." Importantly from a tyre maintenance perspective, lower tyre pressures also resulted in poorer wet road grip - the worse scenario is an under-inflated, near bald tyre. In addition to the longitudinal performance testing (ie braking and acceleration), lateral testing was undertaken. This is indicative of cornering performance. Interestingly, the results for cornering were very similar to braking - for both cornering and braking, the performance of a tyre decreases both as the tread becomes more shallow and the water on the road deeper. "Again... for a tyre approximately 50 per cent worn, lateral friction forces at highway speeds are reduced to about half of the new tyre value for this water depth," say the authors. They go on, "At 0.1 inches [2.5mm] of water, and above, the tyres with tread depths of 6/32 inches [4.8 mm] or less have lost essentially all lateral friction and either are hydroplaning, or very close to hydroplaning, at 60 mph [-100 km/h] and higher. Perhaps even more important is the remarkable decrease in lateral friction at highway speeds, well before hydroplaning is expected to occur, even at the lowest water depth considered [which was 1.3mm]." In addition to the tyre machine testing, vehicle testing was undertaken with a 1990 Ford Thunderbird Coupe and a skidpan. Further results were calculated using computer simulation software, and good matching was achieved between the simulation and skidpan results. "At highway speeds... tyres with approximately 50 per cent wear begin to show significant decreases in cornering friction capability, even with the least amount of water for which tests were conducted." The likelihood for disaster was exacerbated when the worn tyres were on the rear of the car. "Simulations at 60 mph [~100 km/h] and above... with rear tyres at 3/32 inches [2.4mm] and 2/32 inches [1.6mm] tread depth and front tyres at 8/32 inches [6.4mm] and 10/32 inches [7.9mm] tread depth, show the potential for yaw instability and loss of control during normal lane change manoeuvres, with even the smallest water depth considered." This doesn't apply if the worn tyres are on the front: "When the tyre positions are reversed, the simulations demonstrate stability in the same manoeuvres." 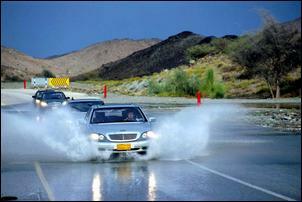 We've known for decades that as tyres wear, their wet weather performance deteriorates. But never have we seen such clearly presented data which shows that the process starts almost from the day the tyres are fitted. Simply, the less the tread depth, the poorer the grip of the tyres in all wet conditions - in cornering and accelerating and braking. There is an additional important point to note. All forces that the car develops are put through the tyres to the road; if the friction levels between the tyres and the road are low, these forces cannot be effectively transmitted. Tyres with low tread depth will therefore massively reduce the effectiveness of ABS and stability control, in addition to those inputs directly made by the driver. Should the Legal Minimum be Changed? The legal minimum tread depth in most countries of the world is 1.6mm. But does this research make a good case for changing that? Should it instead be, say, 3.2mm? At 100 km/h on a road covered with just 1.3mm of water, a tyre at the 1.6mm minimum legal tread depth develops 83 cent less grip than a new tyre. If that minimum level was changed to 3.2mm, grip would be down by only 57 per cent. In almost all of the tests carried out by the two engineers, on wet roads a tyre at minimum tread depth had a dangerously low frictional coefficient at speeds of 100 km/h and above. So, on the basis of this research, it is quite possible to have a car with completely legal tread depths that can aquaplane at legal speeds on what can be regarded only as a relatively small amount of water on the surface of the road. We'd like to see some more research done with a vehicle being driven on varying road surfaces, but this research raises some critically important questions.